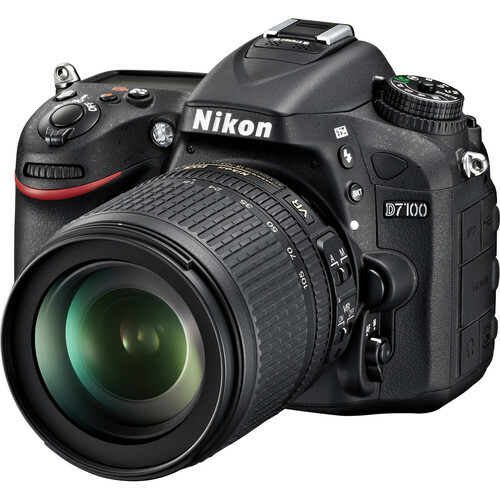 The D7100 DSLR Camera with 18-105mm Lens from Nikon is a high performance, compact DSLR camera with high resolution photo and Full HD video capability. It is bundled with the 18-105mm f/3.5-5.6 lens which is versatile wide-angle to telephoto zoom lens specifically designed for the DX format. D7100 DSLR Camera with 18-105mm Lens is rated 4.8 out of 5 by 96. Rated 5 out of 5 by LONE RANGER from D7100 REVIEW This is a great camera. I use it for high-speed nature photography and family photos. It takes excellent pictures with the 18-105 lens and the AF (auto-focus) is very fast. I'm still tweaking the settings on auto-focus to make it work the way I want it to. It takes about a week to learn all the features. It's jam-packed with features! It has very good battery life with the standard battery and the built-in flash works very well for many situations. The video capabilities are probably not as good as my video-camera, particularly the mic-level metering. But I have a pro video cam that shoots native Blue-Ray, so I only use the D7100 for still photos. Rated 5 out of 5 by J. Granville Chandler from Awesome camera I've been a pro since 1967. can't say I am in that class now but I know I need a reliable, full featured camera at a reasonable price. Been waiting for 25meg pix equipment at a reasonable price foe about 30 years. This one has the specs I need. Reviews of 18-120mm lens not great but I love this lens as a standard duty lens. Fast accurate focusing and sharp clear pics. People are amazed a a pic I took of my cat from about 30' away. Zoom in on his eyeball and you can see the ocean reflected,there. - amazing. People keep asking me 'this is not a pro camera?' No it is not, but it is likely the last one I will have to buy. Rated 4 out of 5 by Satya from Excellent camera, needs matching lens This camera is excellent. The results with 35mm F/1.8 DX and 50mm F/1.8G are excellent. The 70-300mm VR also produces very good results on this camera. The 18-105mm is a compromise but OK for the bundled price if you need the zoom range for convenience. A handful of features such as AF and image quality have improved since the D7000. If you like these features or use them even occasionally, then the additional $$is worth spending. One other improvement I would have liked is higher ISO than the D7000. I don't use video but the quality is good and lack of AF during video is bad. Rated 5 out of 5 by Ptcmini from Replacement for D5100 After three years I felt that it was time to retire my trusty Nikon d5100 that had taken so many wonderful memories for me. I decided upon the Nikon d7100 which I received two weeks ago from B&H with the 18-105 mm lens.I consider myself to be an advanced amateur photographer and am in awe of my new camera! There are so many new features that I am still learning to master. The owners manual was at first intimidating but I have referred to it often and I am gradually learning to master my new camera. The photos are exquisite and everyone agrees that this was a big step up for my personal photography. I can't wait for opportunities to use it. Rated 4 out of 5 by MichaelRH from Beautiful! I recently bought the D7100 to film a high quality video for school and for general photography. I've been a photagopher for years and love the D7100 for its 24.1 megapixels, its face recognition, and its noise redutcion calabilities. The video this camera can take is fantastic quality and the ability to record in 1080i 60fps is very useful. The only issue is that in oreder to record in 1080i 50 or 60fps, one must turn on 1.3x crop, taking away from the image quality. Rated 5 out of 5 by Mountain Man from Nikon's latest digital SLR I have 7 Nikon cameras. I guess you could say, I like Nikons. I will compare this new D7100 to the D50 and the D90. First of all, most certainly the D7100 has them all beat on resolution. It has a good feel, very solid, but then so are the D90 and the D50. The D7100 is a tad bit bigger and heavier but not by much. I do like the better controls and menus. I really like that the control knobs on the D7100 have locks on them. This was a big problem on both the D50 and the D90. Almost every time I would take a photo with them, the control on the top left would have turned to manual or who know what so that I would end up with a garbage photo. If the photo was an action shot, too bad; you can't retake it. On the D7100 with the locks on this control, no more problem. The menus on the D7100 give you the ability to change just about everything under the sun; well done Nikon. The images good very good, so why did everyone think they needed a filter in front of the sensor? With the resolution of this camera, you can clearly see the differences in lens. Prime lenses are obviously the best and this camera can see that in detail. In fact, this camera is so good, you may be tempted to stop using your zooms and return to prime lenses. You can always blow them up later in your computer. The only thing I have not checked out thoroughly yet is the noise as higher ISO's. That is where the D50 and even the D90 fall down. I will be excited to see if this D7100 is better, so stayed tuned. If you are looking for an economical top notch DSLR, I think it will be hard to beat the D7100 for a while. Rated 5 out of 5 by Manolo Z. from A camera with great features. My wife and I are a pro-photographer combo and bought the Nikon D7100 after reading various reviews online. The camera did not disappoint. It is lighter than I expected and feels solid. Great sensor for low-light conditions or for indoor photography at night, but don't expect to take exterior photos at night without a flash or a tripod - the camera compensates by shooting at a very high ASA which produces artifacts/noise on the photographs. The lens that we bought works great, giving you nice wide angles and very good zooming capabilities. File quality is great too. 300 DPI files that are 20in wide at the JPEG Normal setting. RAW files are almost 40in wide. Dual memory slots allow you to have a spare card or one designated to video or RAW. Overall I am very satisfied with the camera. It's not for amateurs, but in my opinion it will work for some pro and semi-pro photographers. It has for us and we are still discovering new things about it every day. Does it come with a case, or bag? I bought a separate case as well as a Neoprene FlexSleeve, which is great when I need the camera somewhat protected, but also at-the-ready on a hiking trail. Answered by: Ryan Matthew Huban T.
What lense is the best to take photos of the moon? What settings should be used to get the best shots? There are many variables involved in photographing the moon. Please email us at photo@&lt;a href= http://bhphoto.com target= _blank &gt;bhphoto.com&lt;/a&gt; for assistance with your inquiry. What's a good close up lens? Body lenses cover, neck strap, battery &amp; charger I think that was it. do i need to buy a wifi adapter for my d7100? If you want WIFI capabilities, then Yes. It is not needed. I never see the point for my work, but I don't like having many distractions wile I work. Can you use the Nikon SB-700AF Speedlight on the D7100? I see 2 lenses: 18-140 VR DX and18-105 ED VR DXwhat is the difference, other than the length - what does the additional ED mean?Thanks. I wouldn't purchase anything from B&amp;H if I were you. Make sure you don't get a grey market lens from them whatever you do. Hey wanted to ask if there is a payment plan for this camera?